Following Tesla Earnings, Where to Now for the Stock? Tesla beat on earnings and revenue expectations, but there are a lot of question marks going forward. With its first-quarter earnings call now concluded, Tesla Inc (TSLA - Get Report) shares are down almost 5%. That's better than the after-hours lows when Tesla shares were slumping about 6%, but down notably from the initial spike of a few percent when the company released its first-quarter results after the market close. As of 8 p.m. ET, Tesla shares were down 4.5% after hours to $287.70. Right off the bat, Tesla beat on earnings per share, revenue and gross margin expectations, which was likely behind the jump in the share price. For the quarter, Tesla came in a hair under 30,000 total deliveries: 21,815 Model S and X units and 8,182 Model 3s. The company also lowered its CapEx budget significantly, from $3.4 billion down to less than $3 billion. It also stuck to its previous expectation of producing 5,000 Model 3 units per week by the end of Q2. Finally, Tesla reiterated its guidance for roughly 100,000 Model S and X vehicles this year. However, aside from the "highlight positives," there were a number of concerns, issues and question marks. The company said it still expects to generate a positive net income on a GAAP basis and positive cash flow in the third and fourth quarter. Management insisted that costs would come down on the Model 3 and that gross margins would make their way to 25% in 2019. 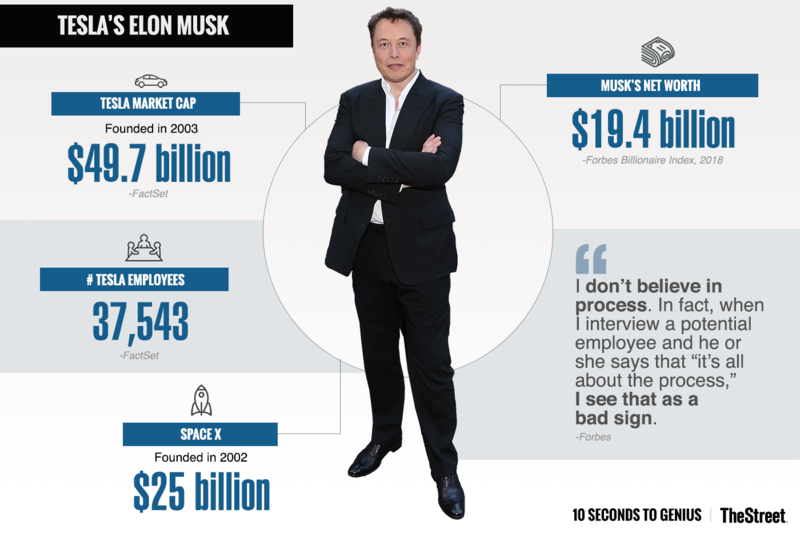 CEO Elon Musk attributed this profitability potential to a restructuring, which will occur this month. When asked on the call about a potential capital raise, Musk was definitive in his response, saying "I specifically don't want to." As for its cash and debt position, Tesla ended the quarter with $2.7 billion in the bank, down notably from the $3.4 billion it had at the end of the previous quarter. Additionally, debt now stands at $10.8 billion vs. just $10.3 billion a quarter ago. All of this boils down to a company desperately needing to increase Model 3 production and cut the costs associated with it. This quarter was indeed an improvement on that front, but it needs to continue gaining momentum through the current quarter and into the second half of fiscal 2018. According to Musk, the company's understanding of production is improving rapidly and they should be able to ramp production going forward. He told Goldman Sachs analyst David Tamberrino -- who has a $195 price target on Tesla -- that it's not "brain surgery." He added that it's a lot of time and work to get it right, but it's very doable. The call took a turn for the worse when Musk grew bored of what he called "dry" questions and stopped taking analyst questions for while. Instead, he allowed a YouTuber to ask a rather large number of questions, which seemed to appeal to the more fun, technological questions. The analysts were hung up on gross margins and production ramps, but at this point it seems they have the right to be skeptical. For a serious investor, that seems concerning. Shares really started to take a hit when Musk refuted a Reuters report from last month saying the Model Y would begin production in November 2019. He said about 24 months from now would be a more accurate timeline, with the goal to start producing the unit in early 2020. The company also hasn't decided where it will build the Model Y at the moment. Musk however is confident in the unit's production potential, saying that the Model Y could be a "manufacturing revolution." He also admitted that from a manufacturing standpoint, the company could have done a lot better on the Model 3 in hindsight. Based on the stock's reaction, it seemed as though the Street was looking for an earlier arrival of the Model Y. So where does that leave us? It's promising to see the production of the Model 3 increasing, as well as the growth in gross margins. It's also good to hear that the company doesn't plan on raising capital and is expecting to earn a profit in the second half of the year. Tesla has very much become a show-me company. Show me you can produce 5,000 Model 3s. Show me you can do it profitably and with gross margins trending toward 25%. Further, the draw on cash and build in debt is also a concern, although it's relieved somewhat by the slash in CapEx. Make what you will of the so-called delay in the Model Y -- which may have been what weighed on the stock in after-hours trading. To me, it still all boils down to the Model 3 and Tesla's wallet, just as we said before. If Tesla gets straightened out, so Tesla's stock can rally. If it can't deliver, shares are in trouble. With that in mind, the recent $250 low looks to be back on the table. As we said, over $300 is good; below is bad.